Busy finishing last minute raking as the trees get naked in the Midwest? The first heavy frost in my garden reminds me it is time to start thinking of the Holiday meal plan. One of my favorite traditions is cooking up a feast filled with plant based favorites for my family and friends. 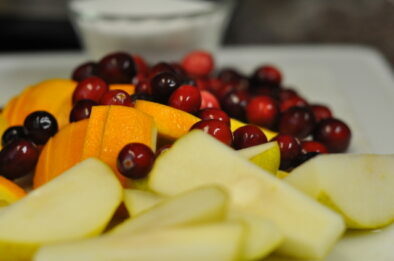 Today I want to share with you my Fresh Orange Cranberry Relish Recipe. This recipe is super simple making it a must to create with in the hour guest arriving. The fresh citrus creates a heavenly scent that will fill your home as you prepare it. Be sure to take advantage of the print option below adding this to your kitchen scrapbook favorites! In separate bowl on the side save 1/2 cup of these cranberries. Stir in 1 cup sugar to the sauce pan. Strip orange with zester creating about 3 tablespoons of zest. Quarter 1 each unpeeled orange and tart peeled apple; remove seeds and core. 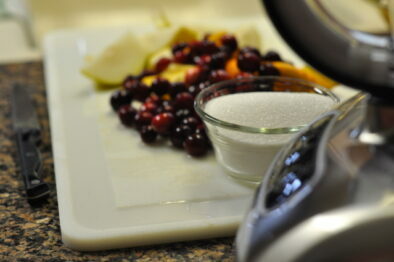 Roughly chop the fruit with 1/2 cup sugar in a food processor. Optional - 1/2 cup chopped toasted pecans can be added with oranges and apples. I’d love it if you retweeted that little video clip! I would love to hear about some of your Holiday Traditions so please leave a comment so I can visit your site. catch up with my blogger friends. Oh, my I love cranberries. Sauce, muffins, bread, and juice. I think I am the only one in the family though. Your relish looks so yummy. Hope you have all your favorite plants in the greenhouse and ready for a long winter stay. I really loved studying your blog. It never occurs earlier than, I’ve carried out studying it becuse of all the awesome info on your article very interesting. Bookmarked already. I too am a big fan of cranberry relish, and enjoy mixing it up every time I make it. However I must admit I don’t just make it for the holidays. It is just as good with chicken, pork or turkey at any time. So live dangerously and cook it up now that it’s a quarter of the price compared to holiday time. I even can some at times.